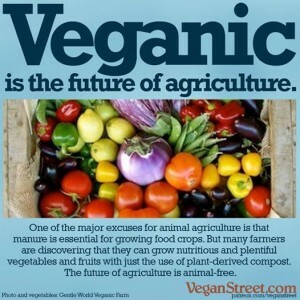 A second guest post by Kelle Kersten on veganic gardening. The ideal garden plot would be in the open, and would have loam soil (intermediate in texture between clay and sand) with a small amount of organic matter (plant and animal residues at various stages of decomposition), which is the type of soil that provides optimal moisture and nutrient retention. Nevertheless, I can attest that you can still produce a bounty of vegetables in areas with partial shade and/or sandy or clay soils. Big Norway spruces shade one corner of my garden in the afternoon. While my yields may be lower for some of the crops that require full sun (such as peppers, tomatoes, eggplant, beans, peas, and squash), I have found that I still get an adequate harvest from any crop I grow in that part of the garden. You could also grow more shade tolerant plants such as lettuce, kale, celery, carrots, chard, and broccoli in shaded areas. In the summer lettuce actually benefits from either natural shade or shade cloth to protect it from the hot sun. Incorporating organic matter into the soil will remedy both a sandy soil that drains too rapidly and does not retain adequate nutrients and a clay soil that holds too much water. In addition to improving the water and nutrient retention properties of a soil, the organic matter itself provides plant nutrients. Veganic gardeners use only plant materials as organic matter, including compost, leaves, hay, grass, kitchen waste, and sawdust. I dig in compost before I plant and then apply hay or grass mulch on the surface around the plants. The mulch protects the plants from extreme fluctuations in soil temperature, retains moisture, prevents soil erosion, reduces weed growth, and eventually breaks down into nutrients used by plants. Many growers will test their soil to determine deficiencies of specific plant nutrients such as nitrogen, phosphorus, potassium, calcium, magnesium, and sulfur. They will then apply materials that are rich in any needed nutrients. I prefer to be less scientific and follow the pattern of nature whereby plants thrive on the natural decomposition of plant and animal organisms. My maxim is to put back in the soil what I take out. I have started to chop up most plant residues after the crops die and leave them on the soil surface to supplement the compost and mulch mentioned above. Basically I observe the growth of my plants and assume they are getting adequate nutrients if they grow well. If something looks a bit yellow, indicating a possible nitrogen deficiency, I may dig in more compost around the plant and/or apply a tea made from soaking comfrey plants for several days. Comfrey is a plant that brings up nutrients from deeper in the soil. I have not found that I need to add any other fertility materials to my soil. Water is another essential component of any gardening endeavor. Plants need about an inch of water per week from rain or watering. I follow that as a basic guideline, however, I will adjust according to the weather, watering more if the weather is extremely hot, dry, and windy and watering less if it is cloudy and cool. I regularly check the soil to see if it is still moist an inch or so below the surface and water accordingly. Since I have large gardens I utilize a drip irrigation system. The advantage of such a system is that the water is targeted at the base of the plants thereby conserving water and reducing the incidence of fungal infections caused by water on leaves. The disadvantage is that when I water I have to water every plant regardless of whether or not a particular plant needs water. In a small garden one could individually check and hand water every plant for optimum moisture provision. Over the years I have tried to pattern my gardening methods as best I can after nature, which means I minimize tilling with machines and hand digging, and I try to keep the surface of the soil covered most of the time. Tilling with a rototiller or plow and, to a lesser extent, digging with a shovel compact the soil underneath the area that is loosened. Additionally, the intricate soil community of organisms is disturbed by these activities. That being said, I still use a rototiller and/or shovel to break up the soil for a new garden plot and then rake and remove the big pieces of grass roots. Since I only have a thin layer of topsoil on top of compacted clay and gravel, I make small raised beds separated by narrow paths by digging up the paths and putting the topsoil on top of the growing bed. This increases the depth of rich and crumbly soil from 4-5 inches to about 10 inches. I add an inch or two of compost and mix that into the soil with a shovel. After smoothing out the surface of the bed to make a flat growing area, I plant my seedlings or seeds in 1-3 evenly spaced rows, depending upon the crop. Then I lay down drip irrigation tape and cover everything with mulch. I keep the mulch away from the base of each plant because mulch can block light rains from reaching the plant roots, decomposing grass can heat up and damage the plants, and mulch can hold moisture at the base of the plant and rot the stems. I water my plants thoroughly after planting. If I am planting in April or early May I will cover transplants and seed beds with row cover for frost protection. I used to only cover more frost tender plants such as lettuce, beets, and carrots, but now I cover everything but the snap peas. Global climate change has brought erratic swings of temperatures, which makes seedlings less able to withstand frost. I plant my warm weather crops like tomatoes, eggplant, peppers, beans, squashes, and cucumbers after June 1st when there is virtually no chance of frost. Throughout the season, I add more mulch as it decomposes, remove weeds, and water as needed. When I water I always give the plants a good soak. Surface watering leads to shallow rooting which makes plants weak and vulnerable to drought. Even with the mulch I have to do a fair amount of hand-weeding. In subsequent years, I plant seedlings right into the mulch without digging the bed at all. I make a hole in the mulch, mix in two pint containers of compost, and then plant. For seed planting I clear a bigger area of the bed and mix in more compost because the mulch could obstruct seed germination. I usually wait until the seedlings are a couple inches tall and sturdy before pulling the mulch back around them.